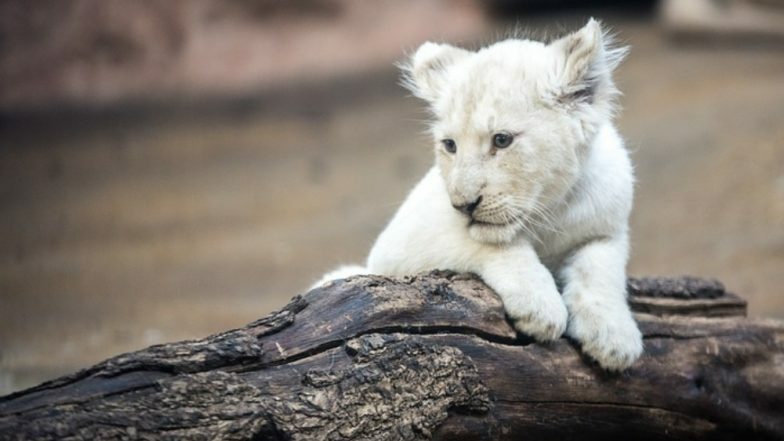 A white lion cub born in Nantong, east China's Jiangsu Province made its first public appearance at the city's forest safari park on Thursday. Born on February 13, 2019, the little one is named after popular Disney character Simba from The Lion King. It's Simba's parents who were both white that gives him a unique physical appearance. Visitors were quite amused as the cub was quite playful on the first day at the park itself. It could be seen playing with an African lion cub amusing. Simba was born through successful in vitro fertilisation and was abandoned by his after birth. Simba who weighed 1.5 kg at the time of his birth was taken care of by officials at Nantong zoo. He now weighs now 7.2 kgs and is quite a playful cub like other cubs of his age. Simba started eating meat when he was just 23 days old and currently his diet includes everything from beef, chicken, chicken bones, eggs and milk formula. 'Pink’ Elephant Found in South African Safari Park, Here’s Why the Calf is a Rare Specimen. White lions are not albinos and have a number of distinguishing characteristics just like white tigers. The findings of these lions with rare physical attributes are considered are a great discovery as hunting over the years have reduced their population in the wild to a bare minimum. White lions are quite rare and their worldwide population is currently less than 300. This cute cub is expected to increase the population of the rare animal species in the world.